I had mixed emotions upon returning home to California after the 1983 August Celebrations. On the one hand, leaving New York was a bit of a let down. One minute I was down on the tennis court throwing tennis balls to Guru, and the next minute I was 3000 miles away in my room in Cupertino. By being in California, I was missing things. It wasn’t as if Guru had stopped playing tennis when the Celebrations ended. On the other hand, being back in California for me was almost -- but not quite -- like being a big fish in a little pond. The regular attention Guru had been paying to me gave me some status. Like I mentioned before, I felt like I was a made man (in a spiritual sense). In a real sense, I was coming into my own as a disciple. Instead of being a 16 year-old, new disciple dependent upon the numerous adult disciples surrounding me for access to Guru, I was now, two years later, in the driver’s seat. At that time (fall 1983), the California Centers -- which included SF, San Jose, Santa Barbara, LA and San Diego -- seemed to be on the move. Worldwide, the American Centers as a whole were on the decline, having peaked in influence throughout the 1970s. By the early-'80s, the Europeans -- led by the German disciples -- were on the ascendant. Nevertheless, there were quite a few young, dynamic and just plain funny disciples in California which made it feel like as a group, the California disciples could be -- nay would be -- a force to be reckoned with when it came to attracting new disciples, starting new disciple-run businesses, and generally bringing positive attention to Guru and his many activities. Chief among these dynamic California disciples were a handful of older and wiser guys from SF, Rick and me of course, and practically the entire San Diego Center (which seemed to be made up of guys who did nothing other than play tennis and body surf all day). Once a month, we’d all get together in one city or another for what we’d call Joy Days, which usually included some mix of fun (tennis, ultimate Frisbee, body surfing), manifestation (i.e., giving a mediation seminar), and socializing (meditating and having dinner together). 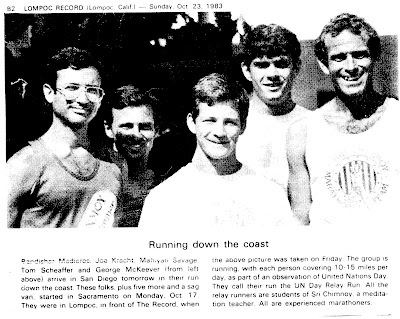 It was at one of these Joy Days that the idea of a U.N. Day relay run from Sacramento, California to San Diego came to fruition. Guru loved the United Nations and for many years had been conducting meditations at the United Nations chapel twice each week. For that reason, the disciples -- at least those in California -- always tried to commemorate U.N. Day in some way. In fact, the first Center-sponsored event that I participated in was to celebrate U.N. Day in 1981. I joined about a half-dozen SF disciples in running a human-powered float (for lack of a better word) from the site of the signing of the U.N. Charter through the streets of San Francisco. The "float" itself was covered in miniature flags representing all the countries of the world. My only distinct memory of that day was a confrontation we had with an African-American man who demanded that we remove the South African flag from our float. On of my quick thinking brother disciples told the man that we'd be glad to remove the South African flag if he could point it out for us (we didn't know which one it was). Neither did he. So, we completed our run through the city without further incident. Back to U.N. Day 1983. I loved the freedom I had to drop everything and join the relay team. While I was never very enthused about public displays of my discipleship, I loved being on the road with the guys. Pictured in the photo above -- from a news account of our relay -- is (from left to right): Bansidhar, then a SF disciple originally hailing from Hawaii; Pujari, then a Santa Barbara disciple; yours truly; Sujantra, from San Diego; and Mahiyan, Guru's primary tennis partner and San Diego Center leader. The best thing about this new phase of my life, however, was being able to visit New York at other times of the year. At that time, a relatively small number of disciples had begun visiting Guru in Queens in the weeks just prior to his annual Christmas Trip (when Guru invited disciples who had been in the Center for some time to accompany him and Alo to some tropical locale for four to six weeks). For the first time, I planned on joining them.